Spotted this big rig westbound LBJ around 10:30 am on Tuesday. 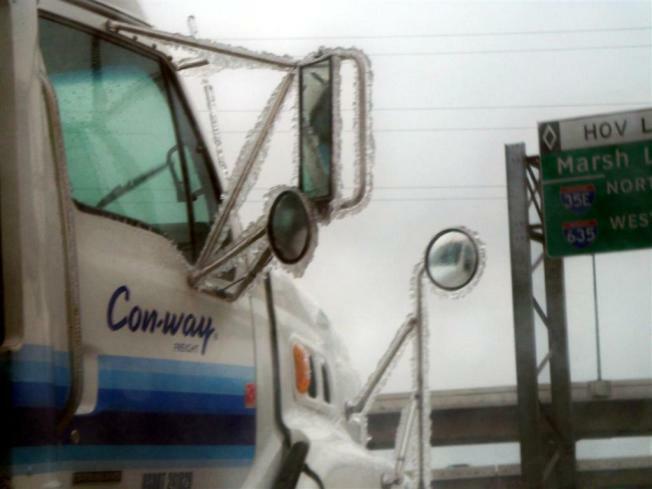 He obviously came from the north - check out the ice on the mirrors! Oakland Mayor Ron Dellums will join officials from state and local agencies and various trucking and community organizations Monday morning to announce an extension on a deadline for truckers serving the Port of Oakland to comply with tough new emissions standards. The extension period will help avert a planned work stoppage by the truck drivers, who are required to retrofit or replace trucks that do not meet the new standards. The extension period, along with $11 million allocated from the California Air Resources Board earlier this week, is designed to help truckers adhere to the new standards, which went into effect Friday. The money from the state air resources board is expected to provide $5,000 apiece to help pay for more than 1,200 retrofits, and $50,000 for owners of 103 older trucks to buy new ones. Under the new standards, drayage trucks manufactured in 1993 or earlier are prohibited from entering ports and other trucks must install a costly new diesel particulate filter. The measure is intended to clean up the air and provide healthier living conditions in communities such as West Oakland that are near ports and rail yards where trucks emit large amounts of diesel. Earlier this year, a total of $22 million in funding was obtained to help truckers pay part of the cost for retrofitting or replacing trucks that did not meet the new standards. The funding came from the air district, the Port of Oakland, the state and the U.S. Environmental Protection Agency. However, many truckers were denied the funds when the initial $22 million ran out. The extension period expected to be announced Monday will apply to all trucks that service the Port of Oakland. Truckers who had applied for the original $22 million but were denied will have until Friday to express interest in the new funds, and until Jan. 15 to fill out all the paperwork to apply for the money, according to Dellums spokesman Paul Rose. At the end of the two-week period, truckers who have gone through the process and received a purchase request for a new diesel particulate filter will be granted waivers to operate at the Port until April 30. The announcement is scheduled for 9 a.m. Monday in Hearing Room 4 on the second floor of Oakland City Hall, 1 Frank Ogawa Plaza. Along with Dellums, Cynthia Marvin from the California Air Resources Board, Jack Broadbent from the Bay Area Air Quality Management District, Omar Benjamin from the Port of Oakland, and representatives from trucking and community organizations are expected to attend.